Hurricane Sandy is a tropical hurricane that formed over the Caribbean and tracked north. 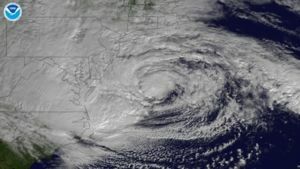 It made landfall on the New Jersey south coast at Atlantic City, south of New York at approximately 20:00 (8pm) Monday 29 October 2012 EDT (11:00am Tuesday 30 October 2012 AEST). The storm has been assessed at three times the size of Cyclone Yasi in Australia. The storm has caused widespread destruction on the east coast of the United States. The storm was reclassified as a nontropical storm because of its unusual meteorological dynamics. 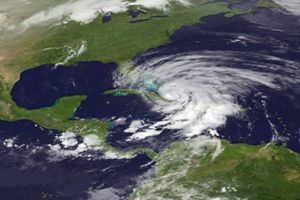 It came ashore at 8 p.m. in Atlantic City, carrying sustained hurricane-force winds of 140 km/h or more and dangerous flood tides. Meteorologists said that the storm lost some characteristics of a tropical storm because of its collision with arctic air. But that collision had also created an unusually large and dangerous storm system spanning nearly 16000 km that was churning northwest toward New York with powerful winds, heavy rain and tidal surges of more than 13 feet in places. Farther west, fierce snowstorms dumped powder across mountainous areas in southern Virginia, West Virginia and western Maryland. more than 50 million people across 12 states potentially affected. The hurricane is expected to intensify when it combines with a low pressure weather pattern. 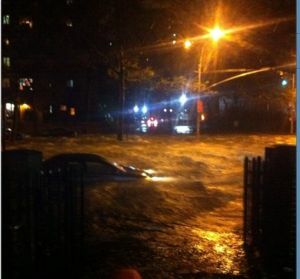 As at 10:00am AEST Hurricane Sandy has already claimed at least 67 lives - including 51 in Haiti. All air travel in the region has been suspended. By Monday afternoon, the nation’s airlines had canceled nearly 8,700 flights and planned to cancel 2,540 more Tuesday, mostly from airports in Philadelphia, New York and New Jersey. Wall Street stock exchange closed for 2 consecutive days. When Hurricane Irene came ashore in 2011 it carried a surge of 4 feet. 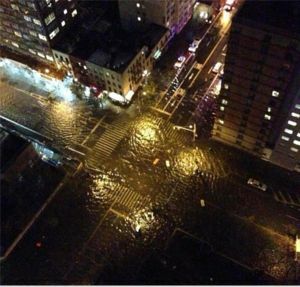 Sandy's surge is expected to be 6 to 12 feet. 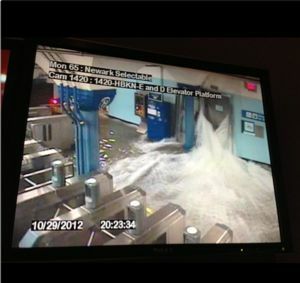 NYC subways will be closed for remainder of the week. All major lines are flooded and will require repair. 5 to 7 foot seas in Long Island Sound, New Haven West. Alarming water levels. Emergency warning issued. 45 billion dollar damage bill is predicted. The safety of the country's oldest nuclear power plant on the New Jersey coast at Oyster Creek (95km east of Philadelphia)was threatened after an abnormal storm surge of almost 2m reportedly pushed water levels at the plant, 'potentially' impacting a "water intake structure" that circulates cooling water through the plant's repository of spent fuel rods, according to a spokesman for the US Nuclear Regulatory Commission. More than 80 homes were gutted by fire at Breezy Point, in the New York borough of Queens. More than 200 patients were evacuated without incident at the height of the storm of more tfrom the NYU Langone Medical Center, in Manhattan, when backup power system failed. Twitter user @Comfortablysmug falsely reported that the NYSE Stock Exchange was flooded link. "The most important message to the public I have right now is, 'Please listen to what your state and local officials are saying'." "When they tell you to evacuate, you need to evacuate." A spokesman for Con Edison says the challenge to restore power in the city that never sleeps is "unprecedented in scope." Initial predictions that power would be back in 2-3 days quickly stretched to 3-4 days, then to 'maybe' 4-5 days. 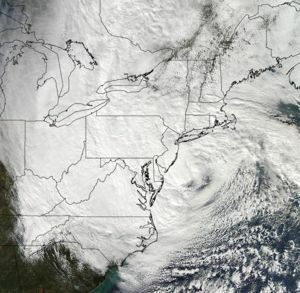 A new storm threatened the US east coast seven days after Hurricane Sandy. Temperatures dropped to near freezing levels on Monday 5 November. 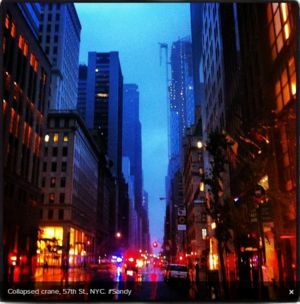 Up to 40,000 people in New York still need shelter and blackouts in some areas continue. In Rockaways - a coastal region in the borough of Queens - thousands of residents were without power for the seventh straight day. At last count, officials were attributing more than 100 deaths to Hurricane Sandy. Some patterns emerged in mapping the deaths in the region. Elderly residents were hit especially hard, with close to half of the people who died age 65 or older. In New York City, the majority of deaths occurred in Queens and on Staten Island, and most people perished at the height of the storm, drowned by the surge. In more inland areas, downed trees were more often the cause of death. The days after the storm were also deadly, as people tried to clear away storm damage or used poorly ventilated generators to ward off the dark and the cold. Some victims’ names have not been released, as the authorities seek to reach their families. Follow the direction of local officials - If told to evacuate, do so immediately. Know the forecast in your area - Continue to monitor your NOAA Weather Radio and your local news for severe weather updates, warnings and watches. Follow your forecast at http://www.weather.gov/ on your computer or http://mobile.weather.gov on your phone. Turn around, don't drown - The potential for heavy rains can also lead to flooding, or flash flooding in some areas. Driving through a flooded area can be extremely hazardous. Make final preparations - If you're further inland, now is the time to make final preparations. Visit http://ready.gov and be ready for power outages and stock up on emergency supplies of food, water, medications, and other supplies. Check on your neighbor - Make sure they're ready, too. Finding shelters --Download the Red Cross Hurricane app (http://redcross.org/mobile-apps/hurricane-app), visit http://redcross.org/find-help/shelter, or check your local media outlets. You should also register on http://redcross.org/safeandwell, a secure and easy-to-use online tool that helps families connect during emergencies. Finally, you can download the FEMA smartphone app (http://fema.gov/smartphone-app) or text SHELTER and your Zip Code to 43362 (4FEMA). Standard rates apply. Donate blood - If you don't live in an affected area, please consider donating blood, because numerous blood drives have been canceled as a result of the storm. To schedule a blood donation or for more information about giving blood or platelets, visit http://redcrossblood.org or call 1-800-RED CROSS (1-800-733-2767). Hurricane Sandy strengthens off US coast, ABC News (Australian Broadcasting Corporation), 30 October 2012. This page was last modified 05:15, 19 November 2012. This page has been accessed 55,398 times.